Each person has the capacity to be a leader and to grow in their leadership influence. Great leaders make the most of wherever they are at the time. When you only influence your generation, you limit your influence and longevity. Men of influence all have one thing in common: Influencing other men positively. Last fall, a small dinner party was planned for Jeana and me. Unknown to us, some men whose life had been shaped dramatically under our ministry here, along with their wives, had traveled in for this small gathering. Others shared stories via video. In this gathering, we celebrated something I suppose I had taken for granted as I was living in the stream of daily ministry life: God had used me personally to help shape their lives positively. Stories they shared were serious as well as humorous, and a few even took the opportunity to point out humor in some of my habits. It was a very special evening to Jeana and me. Men of influence all have one thing in common: Influencing other men positively. Based upon this extraordinary evening, a few days later our Leadership Team reached an important decision. We knew we needed to intentionally celebrate men positively influencing other men. What had been witnessed by each of us was a dynamic reality: Those men had grown up and are now positively influencing other men. Each of these influencers are dynamic forces in leadership at churches and ministries in a positive manner today. God is using them to shape the lives of other men. This entire experience reminded me of a powerful word from the Bible. There is nothing like experiencing 2 Timothy 2:2 personally while simultaneously seeing it lived out in the lives of others. This weekend on Friday night and Saturday morning at our annual Northwest Arkansas Men’s Conference, we will forward this compelling vision of men positively influencing the lives of other men. Thus, our theme is MEN OF INFLUENCE. Unfortunately, there is no way to invite all of the influencers from last fall’s gathering to speak to the men who will gather for this conference. However, we have invited four influencers to call the 1,200 men who will attend to embrace this compelling vision to be Men of Influence. 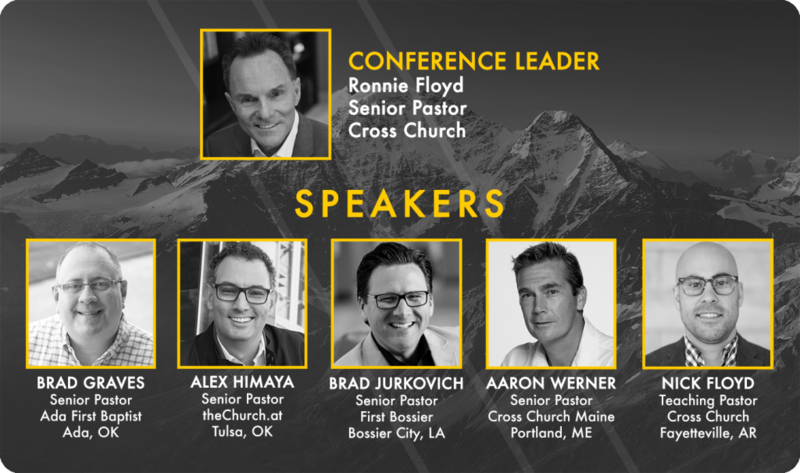 While 90% of the men who attend the conference will come due to being connected to Cross Church, the rest will come from across Arkansas, Oklahoma, and Missouri. I want to encourage men, from younger teenagers to the eldest of men, whether single or married, this conference is for you. If you haven’t already, register now! You may wonder why we invited these leaders to come when you may not have heard of most of them. It comes down to this: We believe these men have a unique message to share with other men… including you. Besides hearing the four men from outside of our ministry, you will also hear from our own Dr. Nick Floyd. Dynamic worship led by our outstanding worship team will explode this environment into a very special and memorable weekend. We believe these men have a unique message to share with other men… including you. Register now! Spread the word. Bring a friend. Gather the crowd. Yes, register today.